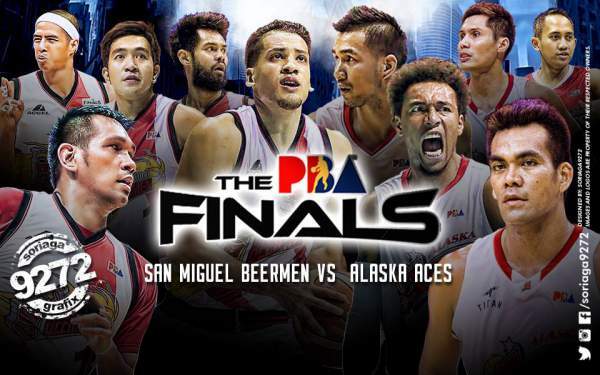 Alaska vs. San Miguel: Finals Schedule, Results, TV and Live Stream Info (2016 PBA Philippine Cup) - Balita Boss! Once again, the Alaska Aces and the San Miguel Beermen will compete for the 2016 Philippine Basketball Association (PBA) Philippine Cup championship in a best-of-7 finals. The top-seeded Alaska routed the GlobalPort Batang in the semifinals to reach the PBA Finals. The series ended 4-1 in favor of the Aces. On the other side, the San Miguel overcame the Rain or Shine Elasto Painters in best-of-seven semifinal series, 4-2 to set up a rematch with the Alaska. The two of the most successful franchises in history of PBA will be meeting for the third time in the 4 last conferences. In their two championship series last season, the Beermen emerged victorious. They defeated the Aces in the Philippine Cup 2015, 4-3 and blanked the team under the ownership of the Alaska Milk Corporation 4-0 in the finals of PBA Governor's Cup. The San Miguel are gunning for their 22nd title, while the Alaska, who last won an all-Filipino crown in 2000, wants to win the franchise 15th title in the PBA. Who will win this time around? Will the Beermen continue their mastery of the Aces or will Alaska finally grab the crown from the Beermen?